In this post, we will see how to find start node of loop in linkedlist in java. We have already seen how to detect a loop in linkedlist in java. This is extension of that post. It is quite easy to find starting node of loop in linkedlist. 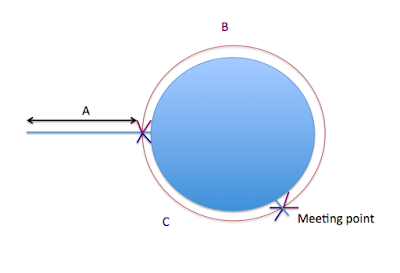 Find meeting point of slowPointer and fastPointer. set slowPointer to head node of linkedlist. Move slowPointer and fastPointer both by one node. The node at which slowPointer and fastPointer meets, will be starting node of loop. You must be wondering how above approach will work. Hence if we set slowPointer to head and move both slowPointer and fastpointer by one node, they will meet at start node of loop.